There's a new food tour in town. The Secret Food Tours. Recently I had the pleasure of taking this new culinary experience which launched a couple of months ago. 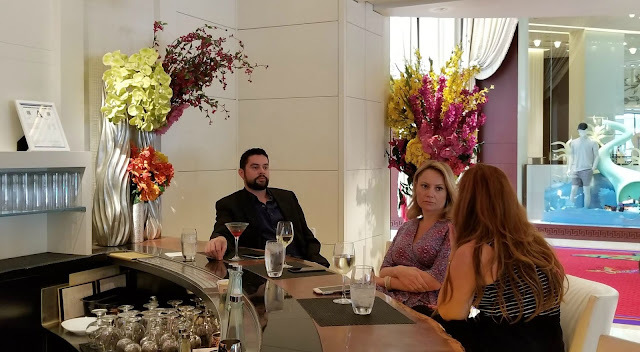 Instead of the usual haunts like Ocean Drive or Wynwood, it was refreshing to learn this tour was in the SoFi area--south of 5th Street in South Beach. 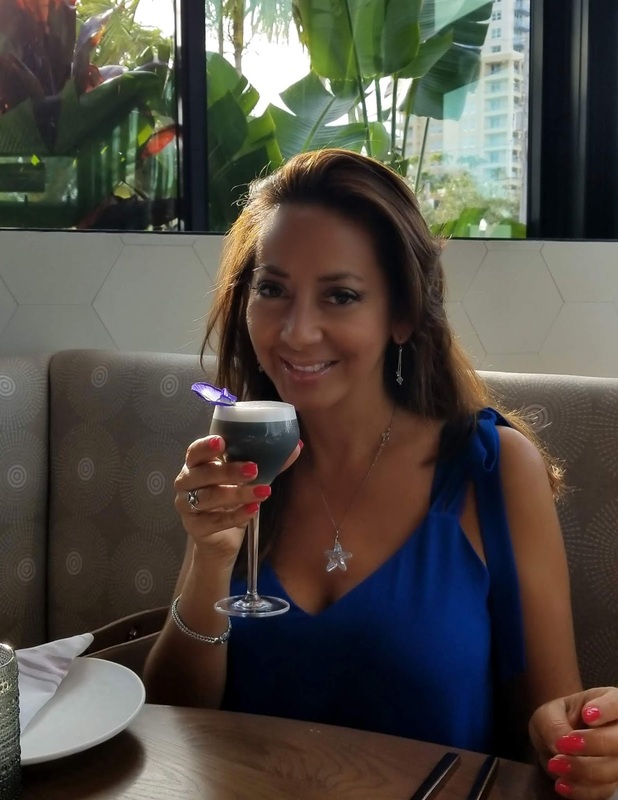 SoFi is the latest hot spot for trendy and high end restaurants and without the madness of the party crowd typical of Ocean Drive. On this Secret Food Tour we visited the newest restaurant, the oldest restaurant and also restaurants representing cultural influences in Miami. The ticket price was $69 and included the typical five tastings of a food tour. I opted to include the cocktail package for an additional $35 for three cocktails. So what was my overall impression? Well, as my readers and friends know, I offer an honest opinion and review. No one from the tour company asked me to write this blog post. So you'll just have to read through this post to find out! Before I continue, a note: I purposefully will not reveal the restaurants as that takes away from the element of surprise. Our group included a couple from Chicago and another from north east coast both in their mid 50's. I nice small group, just perfect as I really dislike large group tours. We met our tour guide Natalia at 5:30pm at South Pointe Park and after a brief introduction, we walked to our first restaurant, the newest one. Shortly after we were seated our first cocktail arrived. It was black, or dark gray. But Natalia had already told us the name --something with Bourbon and charcoal. Yes charcoal! While the color was not aesthetically appealing it was absolutely delicious. And my favorite cocktail of the tour. The flower we learned, was called the clitoria. It certainly was the perfect color and shape to adorn our dull looking drink. Sipping our cocktails, our group immediately bonded. We were thoroughly enjoying ourselves and the tour had only begun. Great first impression. Then the first dish was served, called Queso, which means "cheese" in Spanish. Natalia cleverly waited for us to sample it before revealing the ingredients. It was a shocker. We then walked to the second stop, the oldest restaurant in South Beach. Here we were not served the signature food item but surprisingly another award-winner. 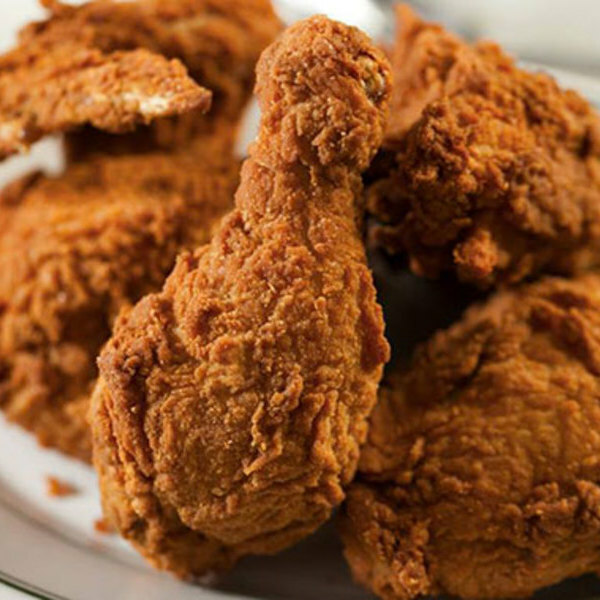 "This is the crunchiest fried chicken in Miami most people don't know about it and costs next to nothing. It's the perfect appetizer to my dinner." "There's something about the way they fry it. The skin is crispy and thin but still really fatty and flavorful at the same time. Hands down, the best fried chicken I've ever had". Thin but crispy and juicy. It's the buttermilk. Our next stop was several blocks away which was ideal as I was getting full early on and the walk would aid my digestion. While walking Natalia our guide shared some history of the area, the movers and shakers in the restaurant industry, and touched on the Art Deco architecture. 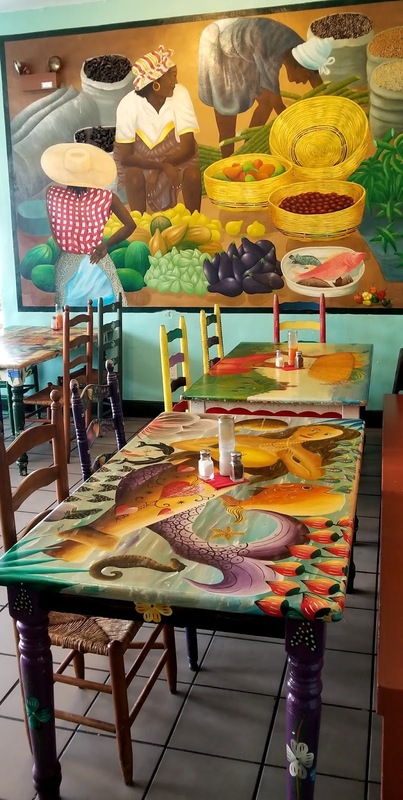 Then we arrived to a restaurant that is well known in Miami, a humble but cultural icon in west Miami that finally arrived on the beach side. 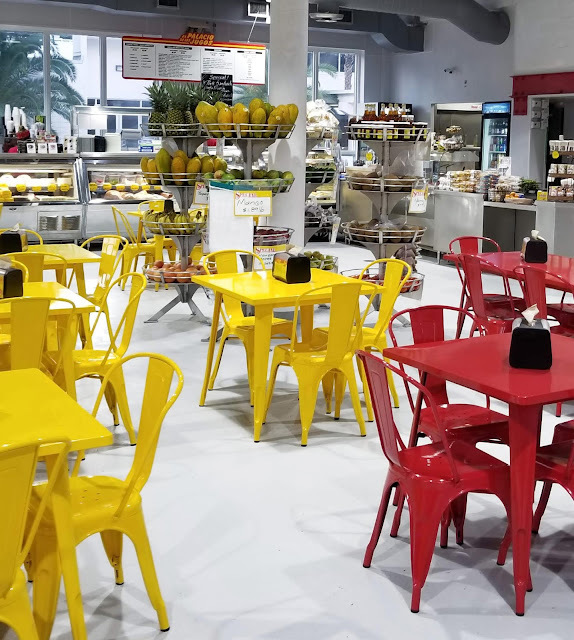 Ketchup red and mustard yellow chairs surrounded by fresh tropical fruits cheerfully greeted us. My taste buds were dancing, in anticipation of flavors to come. Here we drank a tropical fruit shake typical of Cuba, the largest population and influence in Miami. For the food, we were served chicharron. Fried fatty pork chunks. It has to be exclaimed here, #foodgasm! The best chicharron I have ever consumed! 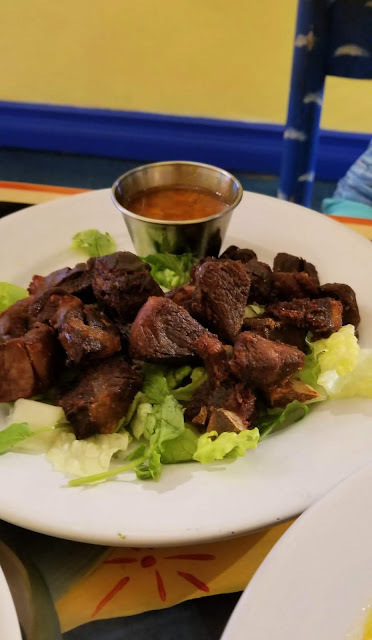 Cuban culture is known for pork, whether it's roasted or fried, the best pork is Cuban style. And Natalia, while not Cuban, does have Hispanic and culinary background to expertly explain this phenomenon. Oh and we also had Cuban sandwiches. A must have in Miami. Stop number four was a restaurant I had not visited in over ten years and was thrilled it still existed. It also speaks to another cultural influence in Miami. Every dining room still has bright hand painted walls and tables. A happy place indeed. This stop unveiled the "secret" food dish. A fried meat dish. Very tasty! I have not had this meat in a very long time. 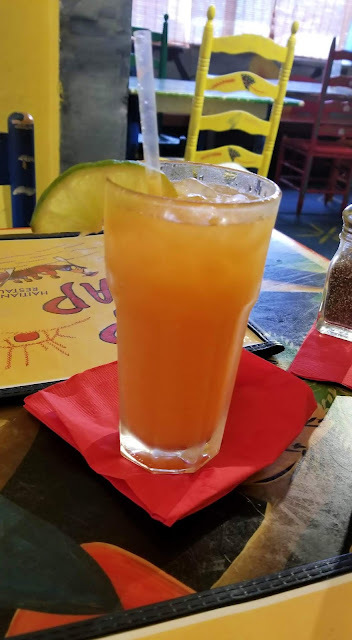 But the rum punch was equally satisfying and included passion fruit and another very rare fruit that is leading in research as a cure to killing cancer cells, soursop or guanabana in Spanish. So by now you picked up on the fact, this tour is best enjoyed by true foodies who have no dietary or caloric restrictions. Savor every bite and flavor. And yet the fifth stop awaited us. Thankfully a long walk offered a reprieve for my gastronomic indulgence. The final stop was on the water. The only downside, it is already dark at 8pm and the water view is definitely best at daytime. But it was a beautiful evening. For the final cocktail the mojito was prepared. Sadly I have to report this was the worst mojito. As a mojito connoisseur and having tasted many at bars known and obscure, I know a quality mojito. But this is an easy fix if the restaurant would use real sugar to make it on a weeknight when it was slow. Simple syrup is often used when bars are busy. Also most guests are not as familiar with this cocktail so they will not be as disappointed. 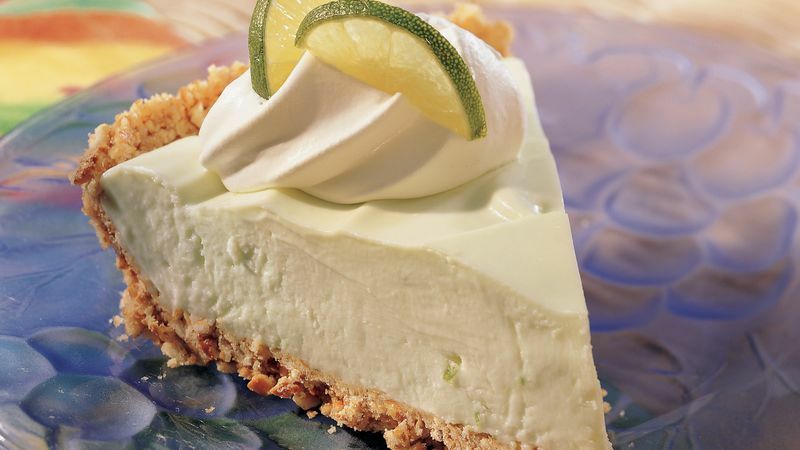 Then came dessert, key lime pie. A native Floridian, I grew up on key lime pies. True key limes are smaller than the regular limes you find in supermarkets. This was indeed the best key lime pie I have ever tasted and was not as tart for my preference. I quickly forgot about the mojito. The pie was a perfect ending. Our group kept chatting that we finally ended close to 9pm. Yes 3.5 hours as Natalia had advised at the beginning. The time flew! Natalia asked us which was our favorite food. We unanimously agreed it was the chicharron but the best surprise was the Queso. Yes I loved it so much I returned a week later and ordered the same cocktail and appetizer. I have eaten plenty of chicharron but unexpected pleasant surprises are definitely memorable. 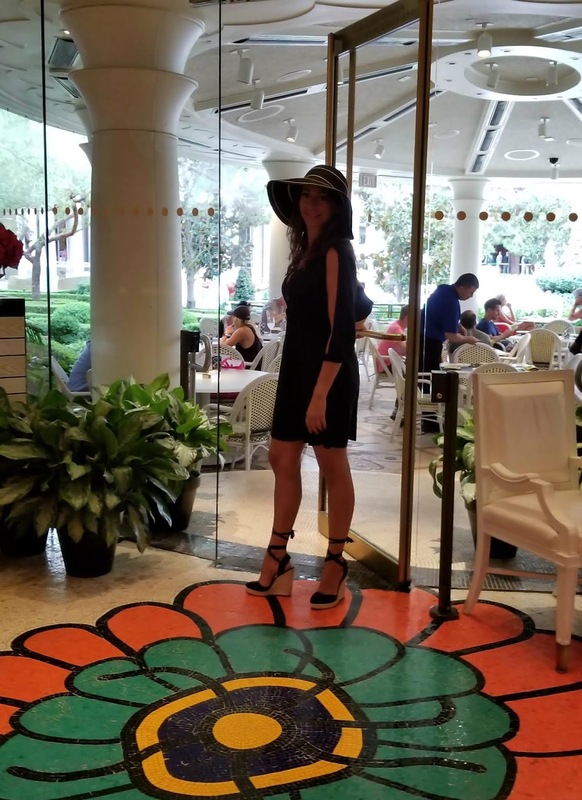 I will be returning again for Miami Spice and brunch. So what did I think of the Secret Food Tour? Overall I loved it. So far the best food tour on the beach. First our guide Natalia is definitely a foodie expert. 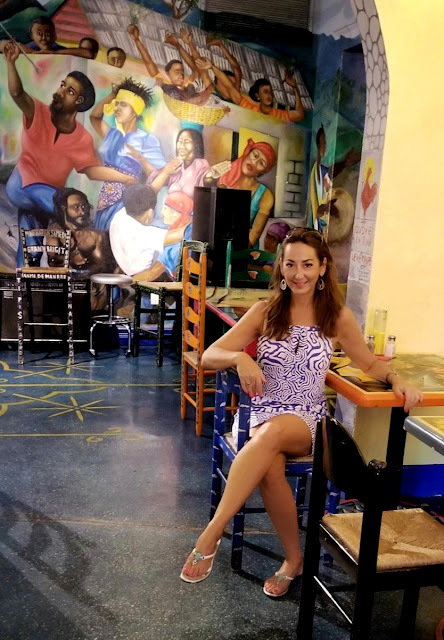 Not only was she raised in Miami Beach, Natalia has worked mostly in progressive and organic restaurants both in Miami and New York City. Along the way she became certified in tropical organic farming and sustainable design and also works part-time as personal chef. Impressive! During the tour Natalia touched on some other facts about the area. One guest did ask a lot more questions about the history. Natalia was a smart girl and knew most answers. As a history buff a bit older than her, I was able to fill in some blanks. But folks this is a food tour, so the guide may not be as versed on other topics. 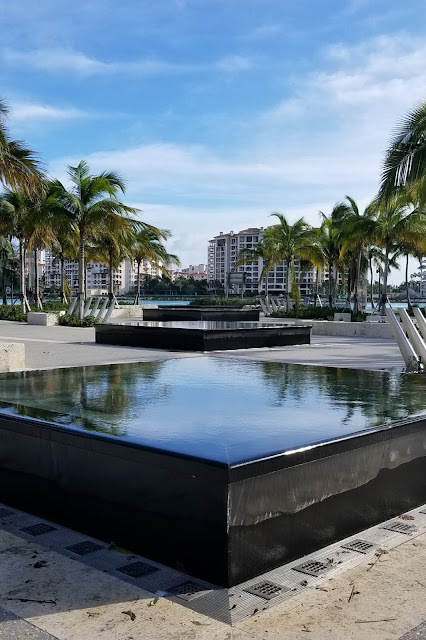 In this case, I recommend taking the Art Deco walking tour for a solid introduction to the fascinating history, development and transformation of Miami Beach. Take the 10am tour, maybe eat a very light lunch and then take the Secret Food tour at 5:30pm and you have a well rounded experience in South Beach if you are limited in time and only have a day or two. Yes it was a fair value ($69) given some of the high end restaurants. The cocktails were another $35. It's all about location. Plus it was a lot of food! I even took home a doggy bag. There was no mention of gratuity but it really is customary and so please do not forget to tip your tour guide adequately, a range of 18-20% is good. The weather. Normally it rains at 5pm during summer/ hurricane season. We were lucky a blue sky overlooked our tour. Regardless, always be prepared for a passing thunderstorm. So do wear shoes that can get wet and carry an umbrella or rain poncho. These tours continue rain or shine as most showers do not last more than 15-20 minutes. The scenery is beautiful. South Pointe has lovely landscaping, more palm trees and fountains. Distinct higher end side of South Beach. Also multimillion dollar condos border the area, mostly vacation getaways for wealthy visitors. I loved going on a Tuesday evening although the area would no doubt have more energy on weekends. As I am always busy, on the run, I appreciated the serene evening. Would I Take this Food Tour Again? Yes. And I will definitely be recommending it to all my visiting guests. While the mojito was a disappointment that was forgotten with the culmination of the key lime pie for this Florida girl. 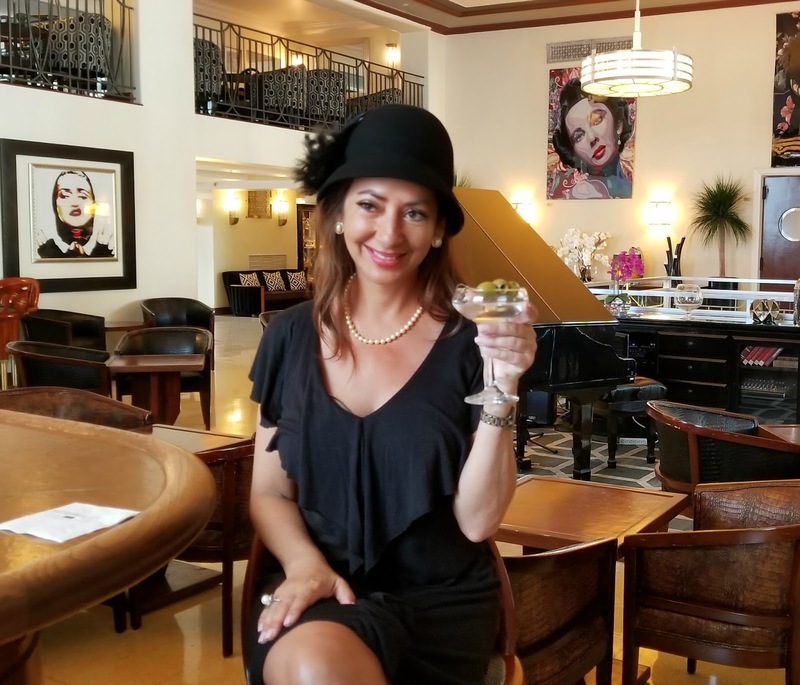 For the best mojito in South Beach, be sure to try the Art Deco Cocktail Tour or Little Havana tour. I do recommend taking this food tour. It was an excellent representation of Miami from progressive, traditional, cultural influence and Florida favorite dishes. And Natalia was indeed a perfect guide to lead it. Thank you Secret Food Tours! My first vacation destination this year was to hotter, drier Las Vegas. While I enjoy hot weather (it was a scorching 110 degrees Fahrenheit, 43 degrees Celsius in July), and beaches and lounging poolside, I also am an avid aficionado of history and culture. Not so much a gambler. 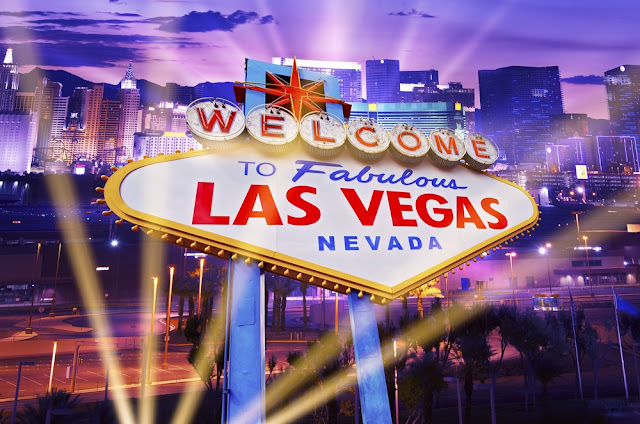 So with sky-reaching hotels replacing 1950's and 60's classics like the Sand, Dunes, the Sahara... was Vegas a Viva or Vaya vacation (Long live or Bust)? Interestingly, the growing number of glitzy, posh hotels tell a story. A new history. I love it. Apart from gambling, drinking and watching shows, the other must-do activity for Vegas visitors is hotel hopping. Immediately I picked up on a telltale sign since my last visit 20+ years ago. A change is occurring. Long overdue and still slow to evolve. Vegas has finally seen the light! (Blog post photos best viewed on large computer screen). Las Vegas is still sizzling with bright digital outdoor lights, whirling slot machines, the ding-ding-ding of the small win, and even non-intoxicated guests like myself still need a map to find their way though the maze of the casino to get to the other side--the hotel guest rooms. But what has changed? The hotel design and decor to attract passerbys, ultra wealthy guests, and to seduce gamblers. If you have visited Vegas old and new then you are probably aware that older Vegas hotels/casinos all have interiors with no windows or natural light or even clocks. Except for guestrooms. A long-held belief is that casino design was meant to have low ceilings void of windows and clocks to help gamblers lose track of time and spend more money. "Really?" I thought to myself. The psychology did not add up to me. At least for this native Floridian, the more sunlight, the more motivation for me to do anything. My immediate thought was that given the history of Vegas, a town built in the middle of the desert as a railroad town and later to build a dam, the men who worked there needed a distraction and entertainment. Soon appeared show girls and later prostitutes and casinos. A Mormon funded town which graduated to a mob haven, (a natural progression of course--slight joke), I would say the buildings were designed to keep these vices clandestine and provide a reprieve from the blinding desert sun. After some research, turns out my theory was correct. According to British psychologist, Mark Griffiths, after 15 psychological studies, he found no conclusive evidence of the effect on windows and wall clocks on gamblers to spend more time. 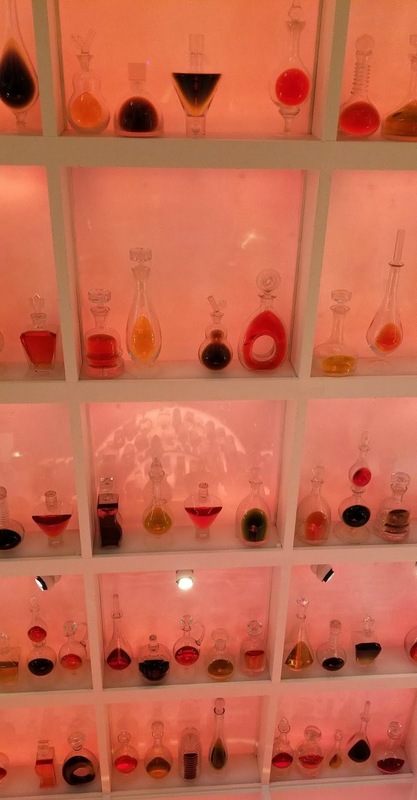 However he did conclude that scent and lighting did affect mood and tendencies to stay longer and gamble more. While theme hotels were the trend for years (Circus Circus Hotel, Paris Hotel) the interior casino design remained the same. 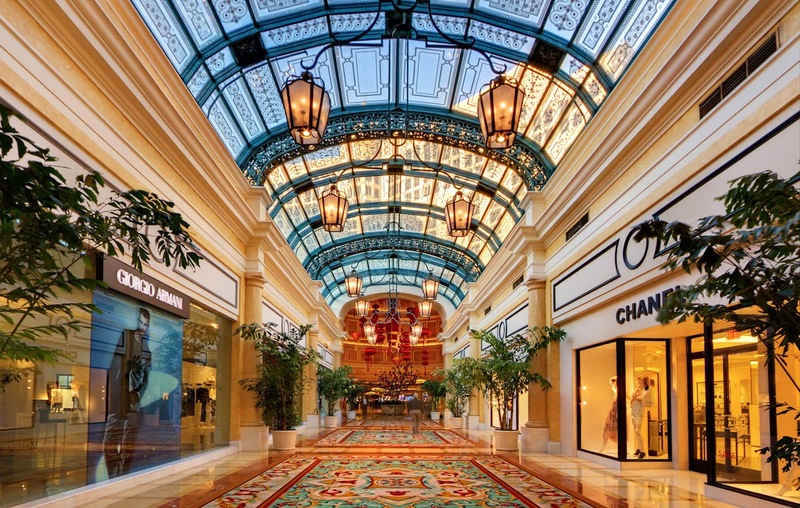 This visit I stayed at the elegant Venetian hotel which opened in 1999. A slice of Venice in many regards. After crossing the bridge and Venetian canal immediately I noticed the change. 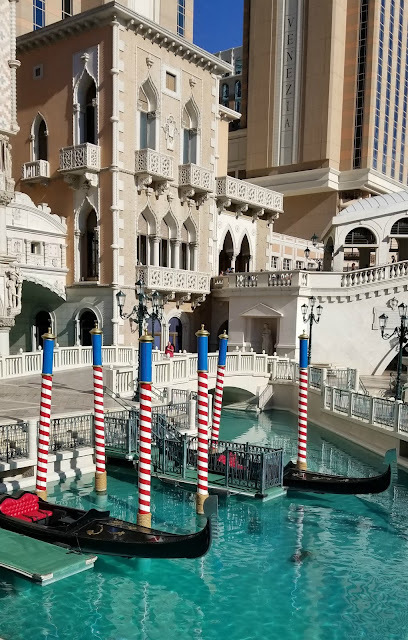 I was entering a fusion of Venice meets Vegas. No windows or natural light and a casino maze to greet me. Here is where I needed a GPS to find the lobby to check in. However the design and attention to detail was stunning. The lobby boasted 25 foot wide columns made of solid Botticino marble imported from Italy. 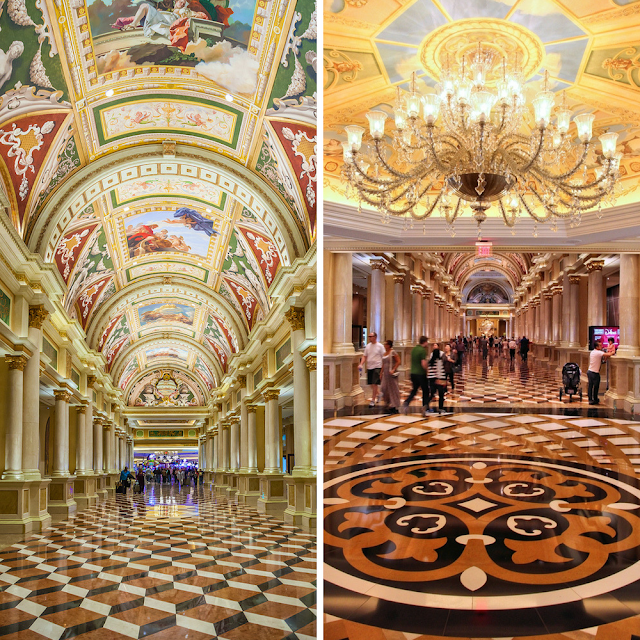 The Venetian Colonnade's marble floor was hand fitted and modeled after the floor of the Church of the Santa Maria del Rosario in Venice. Enclosed restaurant plaza with digital sky (no windows) inside the Venetian and Palazzo hotels. 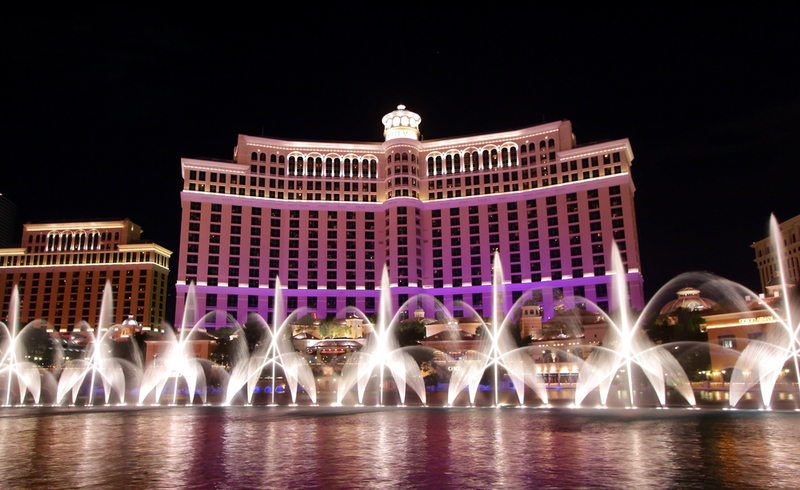 The Bellagio Hotel broke the mold of casino design in 1998. At the time it was the most expensive hotel built in the world at a tune of $1.6 billion dollars. 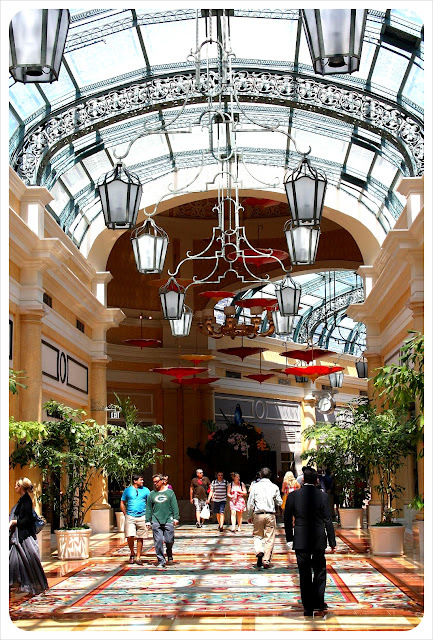 The Bellagio hotel welcomed the natural light in a smart design with high dome glass ceilings to prevent glare. The casinos are still in the center of the hotel with no windows but the surrounding natural light was most inviting, contrary to old hotel design thinking. Vegas was designed for men--the dark macho man caves. The new design welcomed everyone. 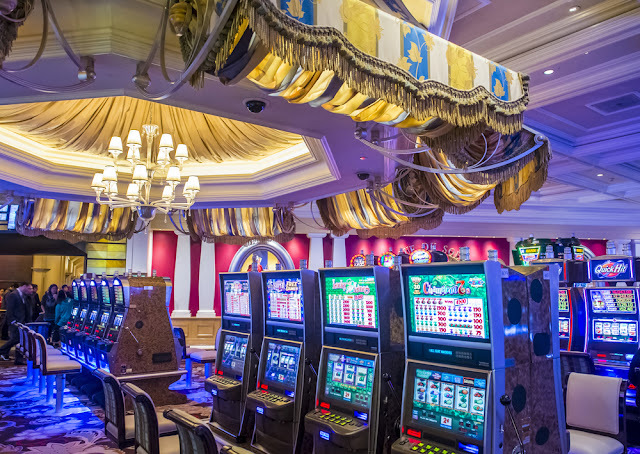 It is no wonder that the person who brought back razzle dazzle to Vegas, creating the 54-foot-high-active volcano (at the Mirage) is Steve Wynn, the creator of the Bellagio who continued to go against the grain of casino gaming layout when building the Wynn hotel. Instead of gaming equipment at the entrance, light, airy, and whimsical elegant decor greets you. A Chihuly glass sculpture or merry- go- round made of flowers and ivory statue horses. Instead of empty walls and no clocks in casino area, Wynn's designer used silk fabrics and antique clocks. The rationale was to induce a feeling of wealth and confidence. Would you prefer a dark room, a cave to hide, or a luxurious room with natural light. It seems the latter has paid off. The wow factor is more than the $2.7 billion price tag of the Wynn hotel in 2005. 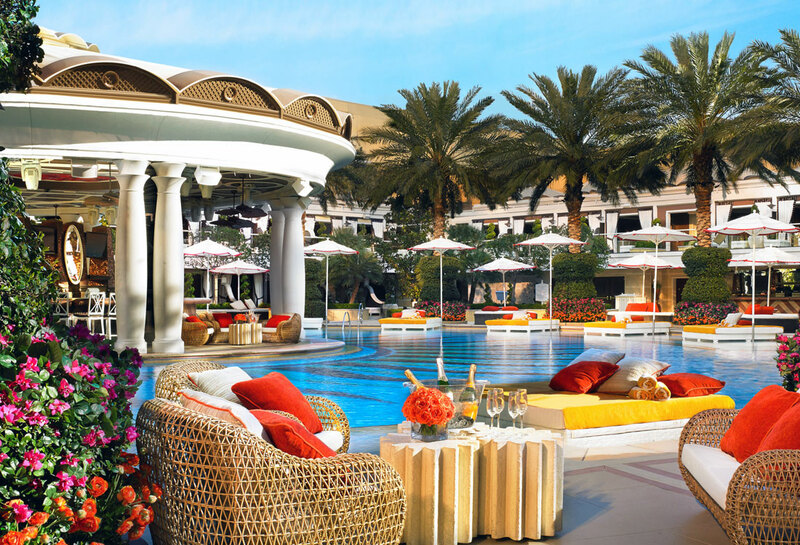 Wynn incorporated outdoor elements, artwork, and maximized the destination for weddings and events. Outside there is the 18-hole golf course. Inside lining the walls is artwork including the Le Reve the Picasso portrait which Wynn reportedly paid $42 million. 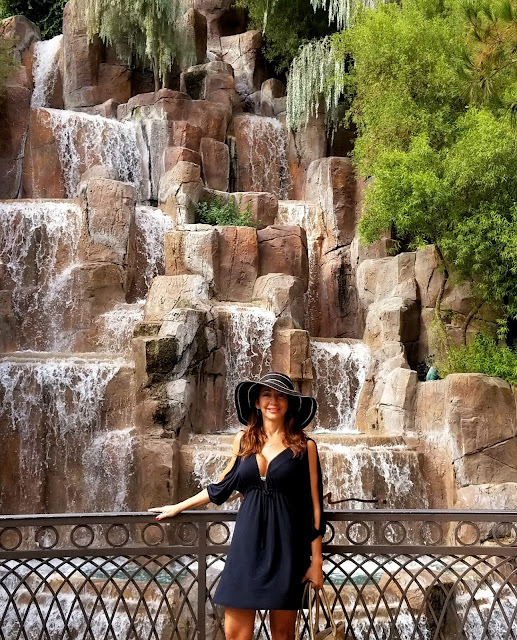 The 15 restaurants, three wedding salons, the Ferrari-Maserati dealership and the casino next to the three-acre-man made lake with the 70 foot waterfall. The Wynn and Encore hotels were built from the female perspective. With layer upon layer of detail. The opposite of the gaming design. My favorite was the Encore hotel which exudes femininity and elegance in every section of the hotel. The pool and the Jardin restaurant stole my heart. The pool with a swim- up bar also features outdoor gaming tables. During my visit, a group of people played at one card game table behind the bar (the covered island pictured below on the left) and were cheering and applauding the entire two hours. In the middle of the afternoon surrounded by a pool, bright day light, and a well stocked bar steps away, guests gambled to their heart's content. Proof again that the "playground" design worked. The Jardin restaurant appeared like flower heaven. A celestial room of flowers! This is the CEILING not the wall of the Jardin bar. Bottles suspended. So delicate like a woman's boudoir. I felt I was in Miami. With sunny hot weather, "light and airy" is a design that is popular for both home, office and restaurant design. Unfortunately time did not permit to visit all the hotels on the strip. I often wondered what happened to the classics like Sahara and Dunes. Were they empty or demolished and replaced? Turns out most were imploded and made way for the new darlings on the strip. So bombing and building is the name of the game. In the past I stayed at the Flamingo and visited Caesars Palace. Today it's the Encore. Below is an abbreviated timeline of select hotels and casinos to look up some of your favorites. So which is your favorite hotel past and present? Leave a comment below! 1946- The Pink Flamingo opens, built by notorious mobster Bugsy Seigel. It is the first luxury hotel on the Strip. (renamed Fabulous Flaming in 1947, the Flamingo Hilton in 1974, and Flamingo Las Vegas in 1999). 1973- The original MGM opens (where Bonanza Casino used to be and where Bally's is now). 1985- The original MGM Grand becomes Bally's. 1989- The Mirage opens, launching the mega resort era. 1990- Siefried and Roy begin their run at the Mirage, which ends in 2003 when Roy Horn is mauled by a tiger. 2005- FTC approves the merger of MGM and Mandalay which now own nine casinos on the strip. 2006- Lady Luck (downtown) closes. 2016- Lucky Dragon, an Asian-themed casino opens on north strip, only to close in Jan 2018. 2017- Westin's casino, Max closes, The hotels continues to operate. 2018 - Lucky Dragon closes, The hotel continues to operate, and casino is slated to reopen within six months. The sultry sounds of saxophone, the dapper singer, the aromatic cigar- smoke filled room...Aaah the allure of jazz music. While salsa, merengue, rumba, and reggaeton fill the clubs and spills out onto the streets, mixed in with blaring rap music and EDM from cars with windows rolled down, jazz music and scene are making a return since it's heyday in the 1930's when Count Basie, Lena Horne and Nat King Cole sizzled clubs on Miami Beach. Many visitors have asked me lately about places to hear jazz music. 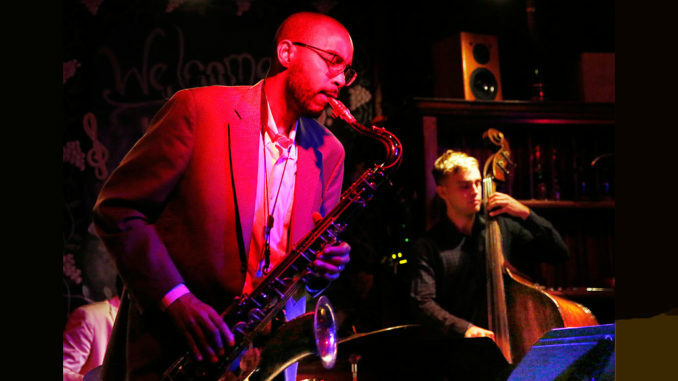 So I created this list of establishments that offer regular jazz music select nights. From your humble locales to original 1930's hotels, there's something for everyone. For a casual setting and to enliven a humdrum start of the week, The Corner in north downtown is where locals continue drinking, mingling and enjoy nightlife music until 5am. On Tuesdays, enjoy live jazz with a full service bar and kitchen for hungry nightowls including hearty sandwiches, soups and salads. If The Corner is your second or third stop of the evening and you have to be at work next morning, this cocktail is for you-- "The Corpse Reviver No. 2" with Tanqueray Malaquay Gin, Cointreau, Lillet, Absinthe, and lemon. No cover charge. In Central downtown, this establishment is a hidden gem. Located just north of the Miami River a block away from the soon-to-be-closed Macy's department store, Le Chat Noir is a favorite of mine. First the narrow street level entrance with handsome dark wood paneling reminds me of a romantic, cozy, candle-lit French bistro. It gets better. Descending down a staircase to the basement (yes a rare basement in Miami!) one discovers an old cellar lined with wine bottles and small stage for musicians. 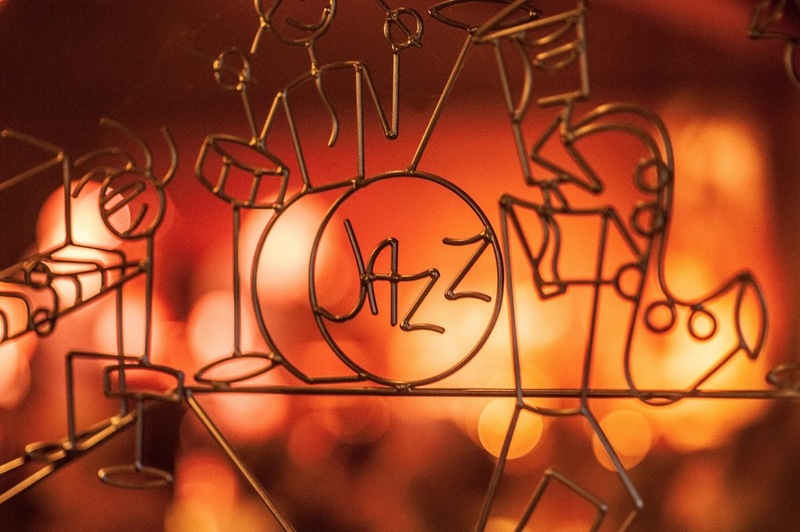 Start the evening in the upstairs piano lounge enjoying drinks and bar bites particularly French-inspired wine and cheese until around 10pm when the jazz comes alive downstairs. ( $10 cover charge) A little known secret: on the outside in front window is an original sign in black and yellow designating the establishment as a nuclear bomb shelter dating back to the 1960s. Basements and bomb shelters were a rarity in a city at water level. 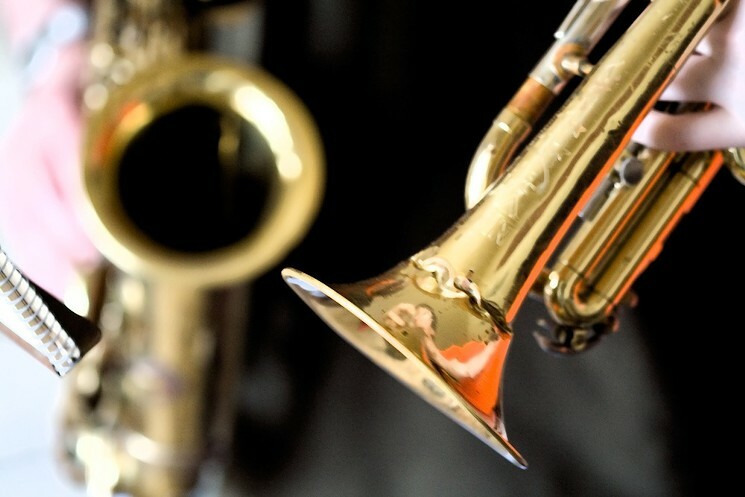 Right on the beach, at 14th street and Ocean Drive, the Betsy Hotel boasts the longest running jazz series. Tuesday-Saturday nights from 6-11 pm, this colonial charming lobby and original pink and cream terrazzo flooring invites you to a free night of live jazz entertainment. Honoring the birthplace of jazz in Miami, for 19 nights February 25 to March 10, the festival features 17 performances by 30 performers. Artists will play wide ranging Jazz genres including Traditional, Ecletic, and Latin Jazz, Root Music and much more. Overtown, one of the oldest neighborhoods in Miami is also home to jazz music in the Magic City. While the Depression cut across all economic strata it forced visit jazz bands, struggling local artists and drifters to collaborate outside of the glamorous South Beach where black artists could perform but not stay in the hotels. I encourage readers to learn more about the music and cultural history of Overtown where great musicians played and Ray Charles made his first record, by clicking here to read this Miami Herald article. It doesn't get any better than this original Art Deco hotel. The elegant National Hotel immediately transports you to the 1930's with its tripartite exterior and Art Deco interior design and decor from the angular railings, nautical portholes, and streamline bar. A grand piano sits in front of the bar tucked around by seats and cocktail tables. 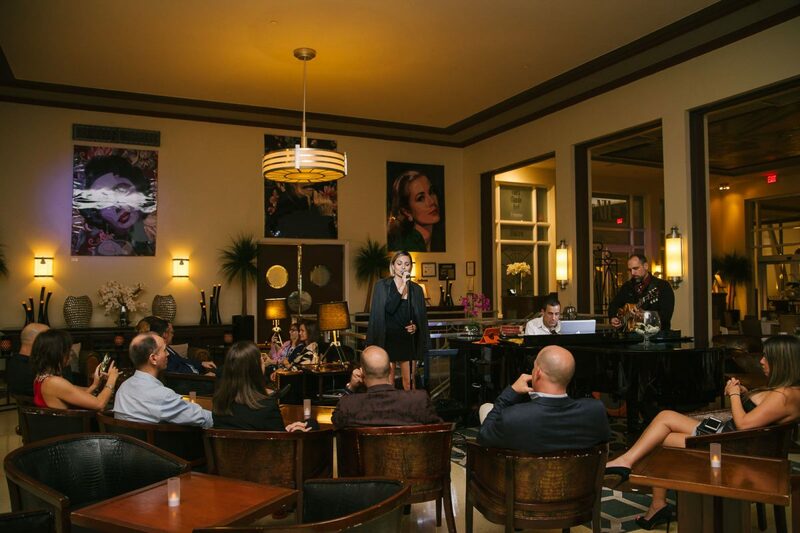 Live jazz music is performed Wednesday to Sunday evenings from the Blues Bar beginning at 8:30pm (in high season now through May). For summer and fall performances, please visit their website for new schedule. The National Hotel also hosts a weekly Sunday Brunch featuring live jazz music from 11am to 2pm ($50 per person).